If you want to create a string of several random letters, simply repeat the formula with an ampersand (&) between each one. You can also add static elements such as a hyphen. The ANSI table might look a little different depending on the settings of your computer, but you can easily make a table that shows all the characters available to you. 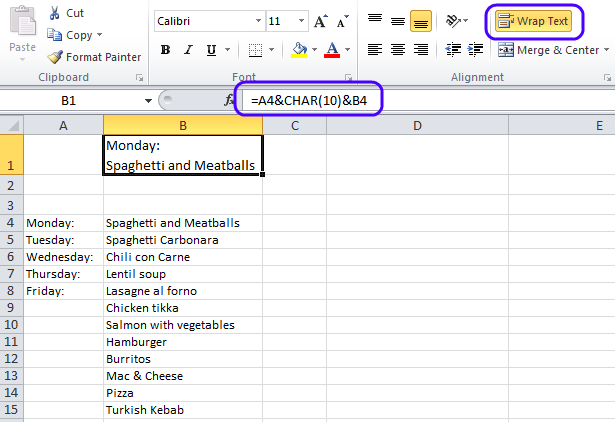 Type the formula =CHAR(ROW(A1)) in cell A1, and copy it down to A255. This will give you a list of all the characters the CHAR function can return on your computer. This function returns 198, which is the ANSI number of the character Æ. You have to allow for line breaks by clicking on “Wrap text” on the Home tab. This entry was posted in Text Functions and tagged ANSI, CHAR, CODE, easy excel, Excel, Text by Audun Danielsen. Bookmark the permalink. Great info. I really like using CHAR(10) to create a line break.